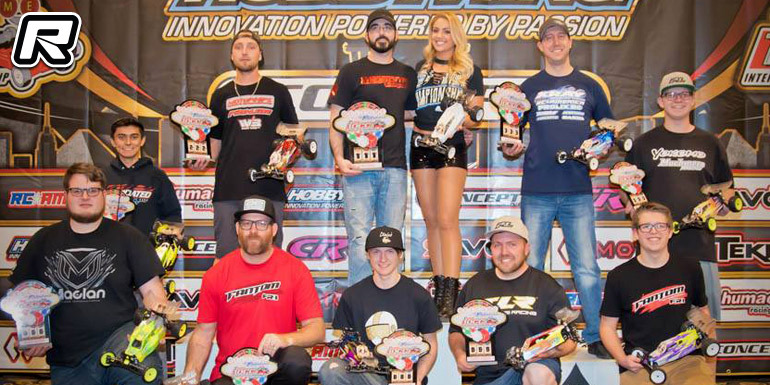 The 2018 International Offroad Carpet Championship was held last weekend at the Westgate Las Vegas Resort and Hotel in Las Vegas, Nevada. Held the week after the IIC the on-road track was added by some entertaining jump section to make for the off-road feeling and the race attracted both national and international racers. By the end of the weekend, 27,661 laps had been laid down at the 2018 IOCC and not a single one unexciting. 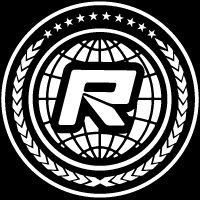 All the classes and the racing were action packed and exciting for all the racers who participated in this event. After qualifying, it seemed like some wins were a sure thing, but main events don’t always go as predicted. Throughout qualifying and the mains, one thing that didn’t show in the 2WD Modified was a clear winner. It would take true talent to shine in this group and local Las Vegas boy Broc Champlin was shining bright. Starting with grabbing the TQ spot, Broc would take the win in the A1 main. Not to be outdone, his brother Blake Champlin was on pace behind him and would take the A2 win. So which Champlin brother take the over all win. The two would battle all the way end tone in the A3 main being separated by only 4-tenths of a second with Broc crossing the line first to take the over all win. The fastest class of the weekend was the 4WD Modified Buggy class and when they ran, everyone stopped what they were doing to come watch the show. Michal Orlowski from Poland is one of the fastest carpet racers in the world and he was definitely showing dominance on the track in this class. Laying down the fastest lap and race times of the weekend, Orlowski was able to take down the A1 and A2 wins and would sit out the A3 main. 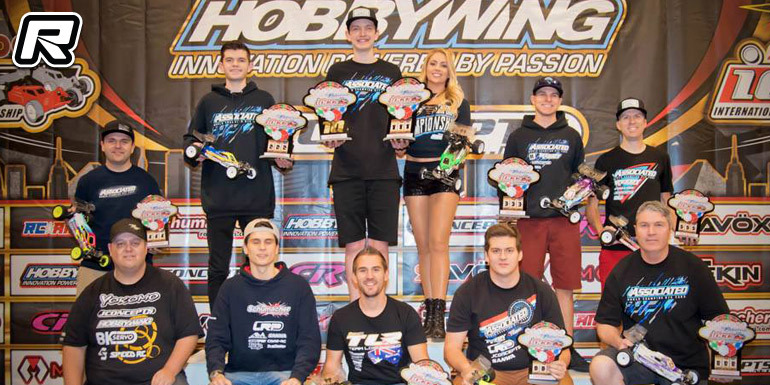 The remaining podium spots were up for grabs and Blake Champlin, Spencer Rivkin and Broc Champlin all had 2nd, 3rd and 4th places finishes. Blake Champlin though, would score the A3 win and that would be enough to grab him the overall second place. Spencer Rivkin would finish in the over all 3rd. The field was stacked deep in the Modified Stadium Track class with Blake Champlin leading the back from the top spot. Champlin’s only job as he saw it was to fend off Max Flurer charging hard behind him. The two would lay down flawless lap after flawless lap with the only factor being getting through back traffic. The few second gap between the two would almost remain identical in the first two mains with Champlin edging out Flurer to take the over all win. Champlin would sit out the A3 main and Flurer would easily win it to take the over all-second spot. The next class up was the old guy 40+ 2wd Modified class. The biggest goal in this class was not a trophy, but bragging rights for a year until the next IOCC. 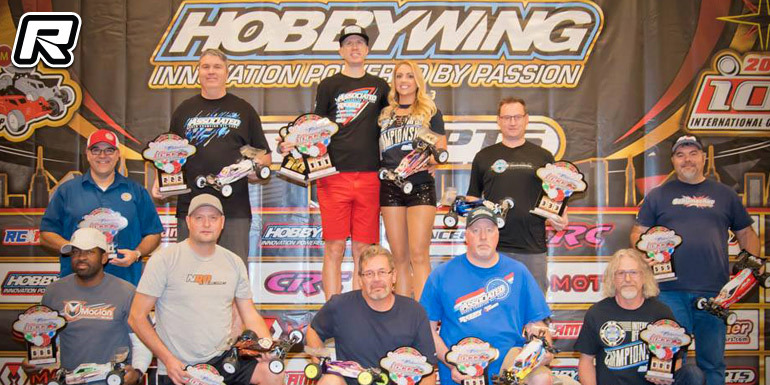 Youth is a nice advantage in this vintage class and one of the younger participants in this group, Team Associated Team manger Brent Theilke had an extra spring in his step and it showed in his race times. Putting on a clinic for the rest, his faster pace allowed him to coast to an A1 and A2 win, which put him on top for the over all win. Chris Champlin finished second with Jason Ruona in third. In 4WD 13.5 Buggy the A1 Main started with TQ Daniel Chavez in the lead and ready to take down the win in the A1 main, unfortunately trouble with traffic knocked him back to finish in the 9th position. He came back with a vengeance though in the final mains. 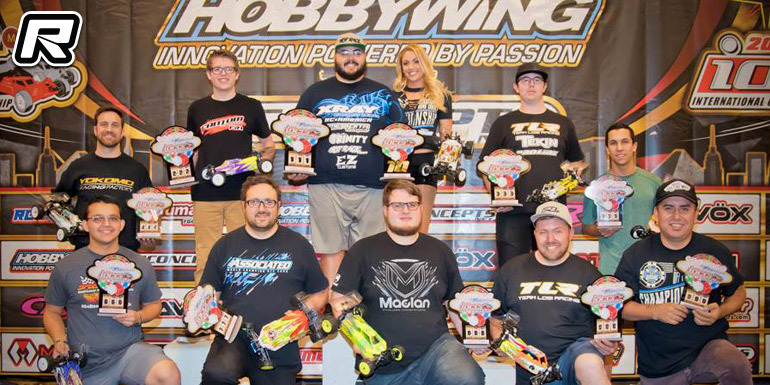 Taking full advantage of his TQ position, he would go on to lay down the fastest runs of the class in the final two mains with very fast 17-lap runs. Dreighton Stoub with finish in the over all second with Hunter King taking the final podium spot. Racing was fender rubbing close in the Short Course 13.5 Blinky class. 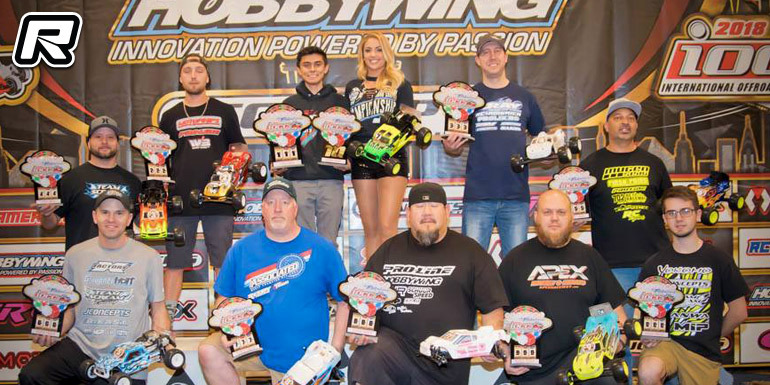 Justin Myerson was the man to beat in this class as he would be starting from the TQ position. Taking the over all win wouldn’t be as easy as he thought though with Steve Hanson all over his rear view mirror. The two put on a show with a lot of ooh’s and aah’s from the crowd. In the A1 main, Myerson would slip away and finish 3-seconds ahead of Hanson. Myerson would put on a clinic in the A2 main finishing a lap ahead of the field for the over all win. 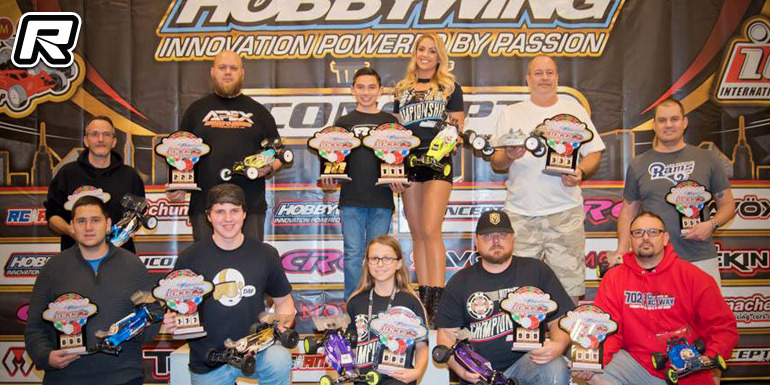 The biggest group of the weekend at the IOCC was the hotly contested 17.5 Stock Buggy with six full heats during qualifying. 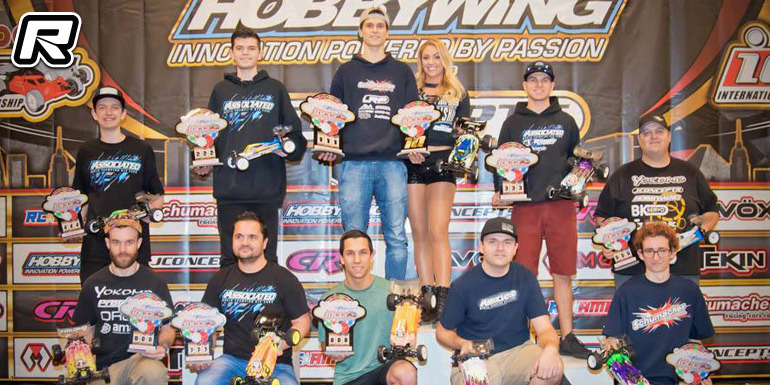 Dreighton Stoub was the TQ of this class, but plagued with bad luck and DNF’s during the mains would knock him out of contention. Ready to step into his place though was Ray Darroch. Darroch started off with quick race times that only got quacking as the round went on. He would take his first stab at the win finishing 2nd in the A1 main behind winner Justin Myerson. The next two mains though, he would put down the only 17-lap runs in this class, which is considerable considering he had to make this way through back traffic while fending off challengers behind him. Myerson would settle for the over all second with John Barron finishing in the over all third. 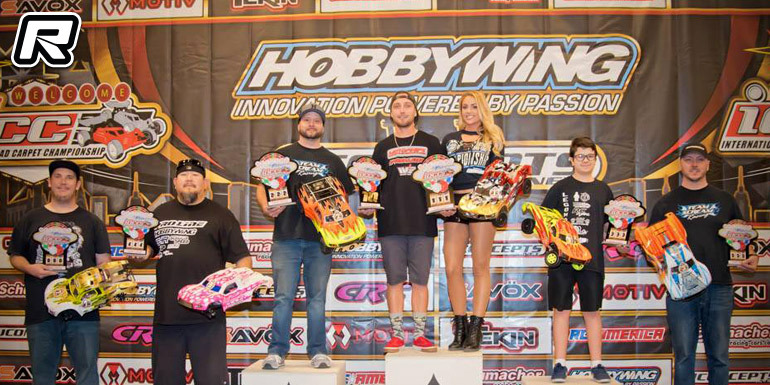 Matthew Gonzales had been dominating the Stock Stadium Truck 17.5 class all weekend during qualifying and carried this momentum into the mains taking huge leads and winning the A1 and A2 mains and the over all win in the class. With the rest of the podium spots up for grabs, it would be an all out battle royale in the A3 main. Justin Myerson and John Barron were the next two in line both having 2nd and 3rd place finishes under their belts. After the dust settled in the A3 main, total points accumulated would put Myerson in the 2nd over all and Barron in 3rd. 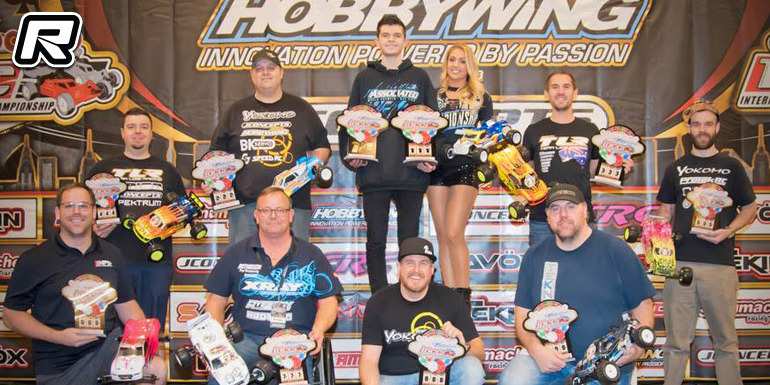 The competition was probably the toughest in the Independent Stock Buggy 21.5 class, solely because everyone used the Hobbywing Justock 21.5 Spec Handout motor. This is a good thing though because it would guarantee an even playing field leaving it up to skill and clean driving to do well. Though a couple of drivers showed good promise, it would be Jeaven Lowry that would throw down the clean laps in the mains. Winning both the A1 and A2 mains with a marginal lead at the end tone, Wesly McCutcheon would take the over all second podium spot with Clay Hunter taking third.